Volkswagen makes its midsize sedan case with the Passat. Volkswagen trailed the competition in utility vehicle options until last summer when it introduced its all-new Atlas midsize crossover, then followed a few months later with the next-generation Tiguan. Immediately, the 2018 Tiguan went from the smallest compact SUV to one of the largest in the segment. Suddenly, VW sales took off as buyers discovered that both crossovers were worth considering. Further, VW finally had a vehicle larger than the midsize Passat, ensuring that at least some customers would not make the jump to the competition. We’ll omit the VW Routan minivan from consideration here, a Chrysler-supplied model last offered in 2014. But not everyone needs or wants an SUV or a minivan. Yes, the market is now skewed towards “trucks” — a vehicle segment comprised of light-duty pickup trucks and sport/crossover utility vehicles. Such vehicles carry a higher price tag than comparable cars and that means there are customers who simply don’t want to expend the extra money for the utility — thank you very much. The Volkswagen Passat is a midsize sedan and this year it comes with a larger, more powerful turbocharged four-cylinder engine as well as the available V6. Comprising the current Passat product line are the following models: S ($22,295), R-Line ($24,995), SE ($26,295), SE with Technology ($29,595), GT (TBD), SEL Premium ($31,650) and SEL Premium V6 ($34,650) trim levels. Besides the new standard engine, the 2018 Passat gains a new GT trim (look for it in the middle of the model year) and offers a six-year, 72,000-mile bumper-to-bumper warranty. The current-generation Passat is now in its seventh year and that means every competing model is newer. That said, the Passat holds its own even if it lacks the pizzazz of some models, namely the Ford Fusion. The Volkswagen Passat is not a head turner, but that isn’t necessarily a bad thing. Its overall presentation is fairly languid — it is easy to cast one’s eyes on the visage, take note that the vehicle is a Volkswagen from its grille and think little more of it. This sedan is traditional and conservative with a high, but even beltline and a correspondingly straight roofline. Every square inch of the sheet metal is straightforward with subtle sculpting — including tasteful embrasures housing the available front fog lights. From the rear, the trunk is essentially unadorned with a narrow strip of chrome-like material connecting the wraparound tail lamps. A tail lip spoiler, reflectors and bumper trim do add visual interest. Standard exterior features include automatic headlights with daytime running lights, power-adjustable side mirrors and 16-inch aluminum-alloy wheels. Work your way up through the Passat grade level and you’ll find such features as LED headlights, LED daytime running lights and LED tail lamps; fog lights; heated side mirrors; 17-,18- and 19-inch aluminum-alloy wheels and a power tilt-and-slide sunroof. Slip behind the wheel of the 2018 Passat, then make your way to the passenger side. Get out again and re-enter this sedan by one of the rear doors. If you insist that the Passat is a large sedan, we understand. Several midsize models push the full-size envelope. The VW Passat is one of them as this model offers no compromise seating for five. True, side-by-side space may be a bit tight for three adults, otherwise rear head and leg room is sufficient. And this does not mean asking front seat passengers to move their seats forward to accommodate you. Just as the exterior seems subdued, the same thinking applies to the interior. The layout is straightforward with an instrument panel hood serving as the most noteworthy feature. Clean lines, easy to identify buttons, switches and knobs, and an uncluttered layout prevail. Numerous hard plastics and soft-touch materials are present, but carefully designed and placed. You’re not getting an Audi-level interior, but you do benefit from German engineering and design. Standard interior features include a tilt-and-telescopic steering column, cloth seats and air conditioning. 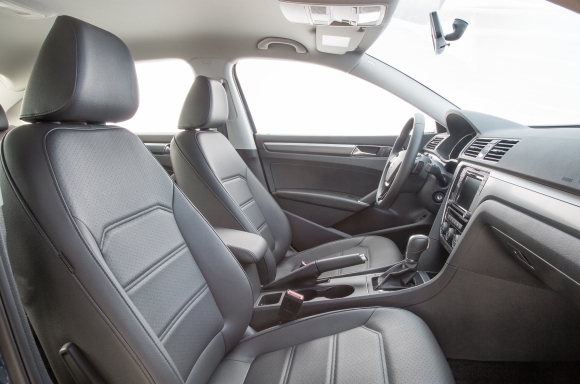 Options are many and include power front seats with driver lumbar support, heated front seats, heated outboard rear seats, dual-zone climate control, imitation or real leather seats and enhanced interior lighting. In safety testing, the 2018 Passat earned a top five-star rating from the National Highway Traffic Safety Administration (NHTSA). The Insurance Institute for Highway Safety (IIHS) awarded this sedan with its top scores in most categories, except the institute assigned a “marginal” grade in passenger-side front overlap crashworthiness. Standard tech features include a five-inch color touchscreen, a six-speaker audio system with a CD player and one USB port. Bluetooth connectivity is also standard. Available features include a 6.3-inch color display, satellite radio, HD radio, VW apps — including Android Auto and Apple CarPlay, navigation, an additional USB port and an auxiliary audio input. A Fender Premium Audio system is also available. Safety tech includes a rearview camera. Driver-assist technologies are available even on the base model. For example, the Passat S offers a Driver Assistance Package ($495) with front assist and blind spot monitor with rear cross-traffic alert. Other trims deliver blind spot monitoring, forward collision warning, adaptive cruise control and autonomous emergency braking. Manufacturers are moving away from V6 engines in droves or at least limiting them to their largest models. With the Passat, you have a choice of a turbocharged four-cylinder engine displacing at two liters with an output of 174 horsepower and 184 pound-feet of torque or on the top-trim models a 3.6-liter V6 engine, generating 280 horsepower and 258 pound-feet of torque. With both engines, power routes through the front wheels by means of a six-speed automatic transmission. The increased performance for the base engine is a welcome change for the Passat. Although light on its feet (wheels), the extra kick in horsepower (4 hp) simply helps this model perform better. Happily, the turbo spools up fast, ensuring that your 0-60 mph time is somewhere in the mid-seven second range. That’s about a second behind the V6 and not a bad response at all. Steering is light to the touch and handling is capable, although not inspiring. But I was happy to be behind the wheel of the Passat as I traveled on an ice-covered state highway behind a plow one winter evening. 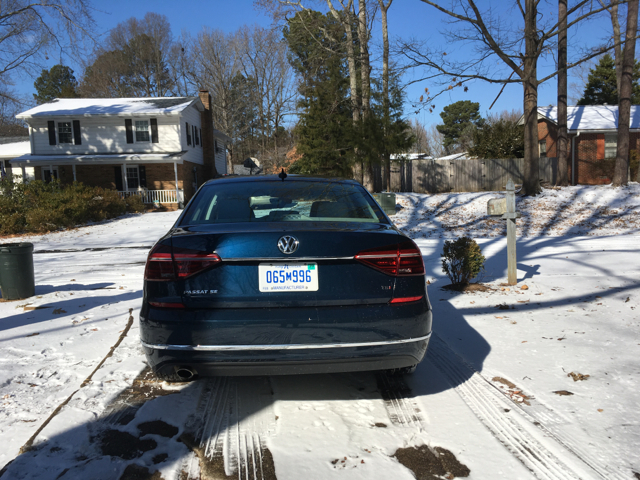 On all-season tires, the Passat maintained its poise as I waited for the proper clearing to supply me with a straight shot home. Braking is firm and overall the ride is comfortable. The midsize sedan segment is shrinking, but some models are holding their own, mostly due to recent restyling. The Toyota Camry is an excellent example of this, while the Ford Fusion is not. In between these two are are host of models, including the Honda Accord, Subaru Legacy, Chevrolet Malibu, Hyundai Sonata, Nissan Altima, Mazda 6 and the Kia Optima. Chrysler, Dodge and Mitsubishi no longer participate in the segment. 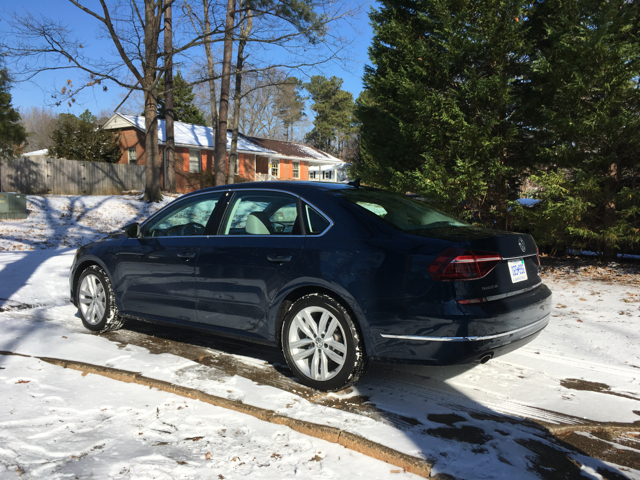 As for the 2018 Passat, the test model would be our pick, although we’d look for discounts to lower its $30,445 sticker price. Also working in the buyer’s favor is VW’s new bumper-to-bumper warranty plan. It adds protection and value, potentially lowering your overall cost of ownership. Importantly, it is fully transferable to a new owner. Interior photos copyright Volkswagen of America. Exterior photos copyright Auto Trends Magazine.